Knopf Publishing Group, 9780307599803, 432pp. Max Tegmark is author or coauthor of more than two hundred technical papers, twelve of which have been cited more than five hundred times. He holds a Ph.D. from the University of California, Berkeley, and is a physics professor at MIT. Prof. Mario Livio, astrophysicist, author of Brilliant Blunders and Is God a Mathematician? "In Our Mathematical Universe, Max Tegmark—a distinguished cosmologist—gives a lucid rundown of the current state of knowledge on the origin, present state, and fate of the universe(s). [...] It is immensely illuminating on the reach of current cosmological theories. [...] From time to time, Tegmark engagingly admits that such ideas sound like nonsense, but he makes the crucial point that if a theory makes good predictions you have to follow all of the consequences. [...] His concluding chapter on the risks humanity faces is wise and bracing: he believes we "are alone in our Universe" but are capable of tackling terrible threats from cosmic accidents, or self-induced nuclear or climatic catastrophes. He doesn’t cite poets but his philosophy adds up to an updated 21st-century version of Thomas Hardy's 'If way to the better there be, it exacts a full look at the worst.'" "mind-bending book about the cosmos" [...] "Tegmark's achievement is to explain what on earth he is talking about in language any reasonably attentive reader will understand. He is a professor at MIT, and clearly a fine teacher as well as thinker. He tackles the big, interrelated questions of cosmology and subatomic physics much more intelligibly than, say, Stephen Hawking." "Max Tegmark's doorstopper of a book takes aim at three great puzzles: how large is reality? What is everything made of? Why is our universe the way it is? Tegmark, a professor of physics at MIT, writes at the cutting edge of cosmology and quantum theory in friendly and relaxed prose, full of entertaining anecdotes and down-to-earth analogies." 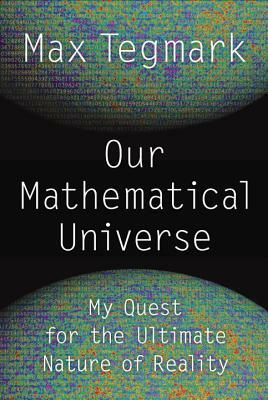 "Our Mathematical Universe is a delightful book in which the Swedish-born author, now at MIT, takes readers on a roller coaster ride through cosmology, quantum mechanics, parallel universes, sub-atomic particles and the future of humanity. It is quite an adventure with many time-outs along the way.... Our Mathematical Universe gives keen insight into someone who asks questions for the pure joy of answering them."